The steps for inserting an image onto a slide are simple. The steps are so simple that on the first day that my students were inserting pictures, they picked up on the pattern quickly and acquired a new digital skill. Modeling and breaking down the task into kid friendly steps is important. 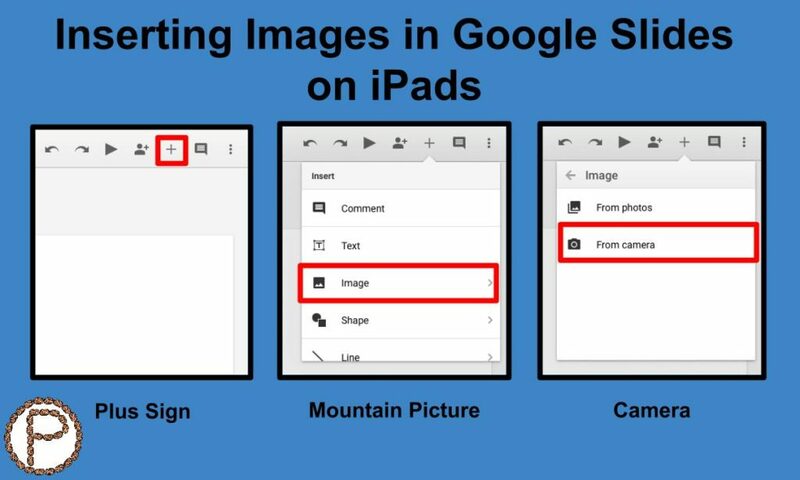 Below is a run through of how I taught this task of inserting images with my students, starting from when they were in Google Slides. If you are standing close to something when you take a picture, you won’t be able to see the whole picture (model that error). If you step back or move your arms in, you can get more in your picture (model this as well). Time to start over! Do you remember how to get to the camera? What do you tap on first? (They can answer these questions after they have inserted a picture two or three times). My kids picked up on those steps quickly. The next time they did an inserting picture task, I went to model how to get the camera and they were telling me they knew or remembered. not moving to the next slide before taking the picture – This means students would have two images on one slide. Point out the back arrow to undo or have students hold down the image for an option to delete the image, or you can show them how to cut and paste it to where it is supposed to go. moving the image too far off of the slide – Encourage the kids to stay in the white area. It’s not too much of a big deal if some of the image is off the slide, but bringing awareness to it is okay. Show them in presentation mode what happens to the image if it is off the slide. the urge to use two fingers to shrink the image – Remind the kids to use one finger and to lightly hold a corner to shrink the image. Adjusting the size of the image without moving the image in the process takes some practice. This entry was posted in Digital Literacy, Google Slides, Tablet by Christine Pinto. Bookmark the permalink.